The manufacturers of Starting and Lighting Equipment have designed their, generators, cutouts, and current controlling devices so as to relieve the car owner of as much work as possible in taking care of batteries. The generators on most cars are automatically connected to the battery at the proper time, and also disconnected from it as the engine slows down. The amount of current which the generator delivers to the battery is automatically prevented from exceeding a certain maximum value. Under the average conditions of driving, a battery is kept in a good condition. It is impossible, however, to eliminate entirely the need of attention on the part of the car owner, and battery repairman. The storage battery requires but little attention, and this is the very reason why many batteries are neglected. Motorists often have the impression that because their work in caring for a battery is quite simple, no harm will result if they give the battery no attention whatever. If the battery fails to turn over the engine when the starting switch is closed, then instruction books are studied. Thereafter more attention is paid to the battery. The rules to be observed in taking care of the battery which is in service on the car are not difficult to observe. It is while on the car that a battery is damaged, and the damage may be prevented by intelligent consideration of the battery's. housing and living conditions, just as these conditions are made as good as possible for human beings. 1. Keep the Interior of the Battery Box Clean and Dry. On many. cars the battery is contained in an iron box, or under the seat or floorboards. This box must be kept dry, and frequent inspection is necessary to accomplish this. Moisture condenses easily in a metal box, and if not removed will cause the box to become rusty. Pieces of rust may fall on top of the battery and cause corrosion and leakage of current between terminals. Occasionally, wash the inside of the box with a rag dipped in ammonia, or a solution of baking soda, and then wipe it dry. A good plan is to paint the inside of the box with asphaltum paint. This will prevent rusting, and at the same time will prevent the iron from being attacked by electrolyte which may be spilled, or may leak from the battery. Some batteries are suspended from the car frame under the floor boards or seat. The iron parts near such batteries should be kept dry and free from rust. If the battery has a roof of sheet iron placed above it, this roof should also be kept clean, dry and coated with asphaltum paint. 2. Put Nothing But the Battery in the Battery Box. If the battery is contained in an iron box, do not put rags, tools, or anything else of a similar nature in the battery box. Do not lay pliers across the top of the battery, as shown in Fig. 27. Such things belong elsewhere. 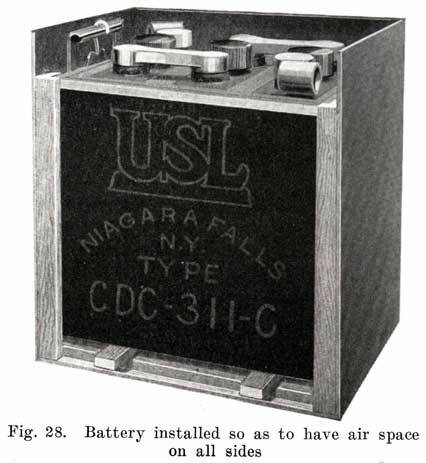 The battery should have a free air space all around it, Fig. 28. Objects made of metal will short-circuit the battery and lead to a repair bill. 3. Keep the battery clean and dry. The top of the battery should be kept free of dirt, dust, and moisture. Dirt may find its way into the cells and damage the battery. A dirty looking battery is an unsightly object, and cleanliness should be maintained for the sake of the appearance of the battery if for no other reason. Moisture on top of the battery causes a leakage of current between the terminals of the cells and tends to discharge the battery. Wipe off all moisture and occasionally go over the tops of the cell connectors, and terminals with a rag wet with ammonia or a solution of baking soda. This will neutralize any acid which may be present in the moisture. The terminals should be dried and covered with vaseline. This protects them from being attacked by acid which may be spilled on top of the battery. If a deposit of a grayish or greenish substance is found on the battery terminals, handles or cell connectors, the excess should be scraped off and the parts should then be washed with a hot solution of baking soda (bicarbonate of soda) until all traces of the substance have been removed. In scraping off the deposit, care should be taken not to scrape off any lead from terminals or connectors. After washing the parts, dry them and cover them with vaseline. The grayish or greenish substance found on the terminals, connectors, or handles is the result of "corrosion," or, in other words, the result of the action of the, sulphuric acid in the electrolyte upon some metallic substance. The acid which causes the, corrosion may be spilled on the battery when hydrometer readings are taken. It may also be the result of filling the cells too full, with subsequent expansion and overflowing as the temperature of the electrolyte increases during charge. Loose vent caps may allow electrolyte to be thrown out of the cell by the motion of the car on the road. A poorly sealed battery allows electrolyte to be thrown out through the cracks left between the sealing compound and the jars or posts. The leaks may be caused by the battery cables not having sufficient slack, and pulling on the terminals. The cap which fits over the vent tube at the center of the top of each cell is pierced by one or more holes through which gases formed within the cell may escape. These holes must be kept open; otherwise the pressure of the gases may blow off the top of the cell. If these holes are found to be clogged with dirt they should be cleaned out thoroughly. The wooden battery case should also be kept clean and dry. If the battery is suspended from the frame of the car, dirt and mud from the road will gradually cover the case, and this mud should be scraped off frequently. Occasionally wash the case with a rag wet with ammonia, or hot baking soda solution. Keep the case, especially along the top edges, coated with asphaltum or some other acid proof paint. 4. The battery must be held down firmly. If the battery is contained in an iron box mounted on the running-board, or in a compartment in the body of the car having a door at the side of the running-board, it is usually fastened in place by long bolts which hook on the handles or the battery case. These bolts, which are known as "hold-downs," generally pass through the running board or compartment, Fig. 29, and are generally fastened in place by nuts. These nuts should be turned up so that the battery is held down tight. Other methods are also used to hold the battery in place, but whatever the method, it is vital to the battery that it be held down firmly so that the jolting of the car cannot cause it to move. The battery has rubber jars which are brittle, and which are easily broken. Even if a battery is held down firmly, it is jolted about to a considerable extent, and with a loosely fastened battery, the jars are bound to be cracked and broken. 5. The cables connected to the battery must have sufficient slack so that they will not pull on the battery terminals, as this will result in leaks, and possibly a broken cover. 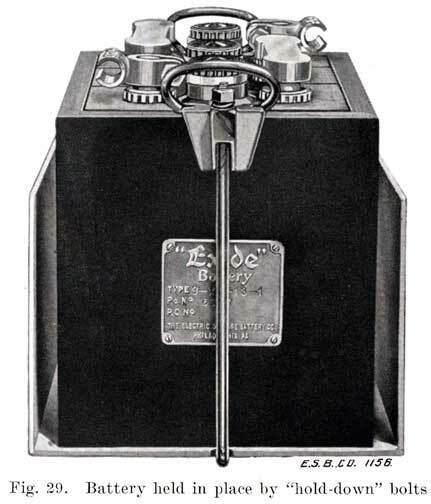 The terminals on a battery should be in such a position that the cables may be connected to them easily, and without bending and twisting them. These cables are heavy and stiff, and once they are bent or twisted they are put under a strain, and exert a great force to straighten themselves. This action causes the cables to pull on the terminals, which become loosened, and cause a leak, or break the cover. 6. Inspect the Battery twice every month in Winter, and once a week in Summer, to make sure that the Electrolyte covers the plates. To do this, remove the vent caps and look down through the vent tube. If a light is necessary to determine the level of the electrolyte,, use an electric lamp. Never bring an open flame, such as a match or candle near the vent tubes of a battery. Explosive gases are formed when a battery "gasses," and the flame may ignite them, with painful injury to the face and eyes of the observer as a result. Such an explosion may also ruin the battery. During the normal course of operation of the battery, water from the electrolyte will evaporate. The acid never evaporates. The surface of the electrolyte should be not less than one-half inch above the tops of the plate. A convenient method of measuring the height of the electrolyte is shown in Fig. 30. Insert one end of a short piece of a glass tube, having an opening not less than one-eighth inch diameter, through the filling hole, and allow it to rest on the upper edge of the plates. Then place your finger over the upper end, and withdraw the tube. 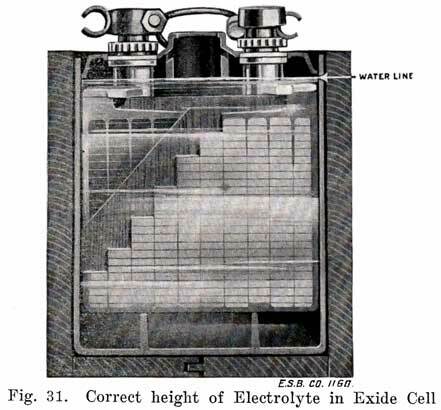 A column of liquid will remain in the lower end of the tube, as shown in the figure, and the height of this column is the same as the height of the electrolyte above the top of the plates in the cell. If this is less than one-half inch, add enough distilled water to bring the electrolyte up to the proper level. Fig. 31 shows the correct height of electrolyte in an Exide cell. Never add well water, spring water, water from a stream, or ordinary faucet water. These contain impurities which will damage the battery, if used. It is essential that distilled water be used for this purpose, and it must be handled carefully so as to keep impurities of any kind out of the water. Never use a metal can for handling water or electrolyte for a battery, but always use a glass or porcelain vessel. The water should be stored in glass bottles, and poured into a porcelain or glass pitcher when it is to be used. A convenient method of adding the water to the battery is to draw some up in a hydrometer syringe and add the necessary amount to the cell by inserting the rubber tube which is at the lower end into the vent hole and then squeezing the bulb until the required amount has been put into the cell. In the summer time it makes no difference when water is added. In the winter time, if the air temperature is below freezing (32° F), start the engine before adding water, and keep it running for about one hour after the battery begins to "gas." A good time to add the water is just before starting on a trip, as the engine will then usually be run long enough to charge the battery, and cause the water to mix thoroughly with the electrolyte. Otherwise, the water, being lighter than the electrolyte, will remain at the top and freeze. Be sure to wipe off water from the battery top after filling. If battery has been wet for sometime, wipe it with a rag dampened with ammonia or baking soda solution to neutralize the acid. Never add acid to a battery while the battery is on the car. By "acid" is meant a mixture of sulphuric acid and water. The concentrated acid, is of course, never used. The level of the electrolyte falls because of the evaporation of the water which is mixed with the acid in the electrolyte. The acid does not evaporate. It is therefore evident that acid should not be added to a cell to replace the water which has evaporated. 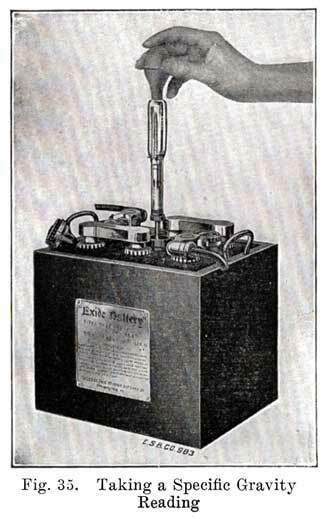 Some men believe that a - battery may be charged by adding acid. This is not true, however, because a battery can be charged only by passing a current through the battery from an outside source. On the car the generator charges the battery. It is true that acid is lost, but this is not due to evaporation, but to the loss of some of the electrolyte from the cell, the lost electrolyte, of course, carrying some acid with it. Electrolyte is lost when a cell gasses; electrolyte may be spilled; a cracked jar will allow electrolyte to leak out; if too much water is added, the expansion of the electrolyte when the battery is charging may cause it to run over and be lost, or the jolting of the car may cause some of it to be spilled; if a battery is allowed to become badly sulphated, some of the sulphate is never reduced, or drops to the bottom of the cell, and the acid lost in the formation of the sulphate is not regained. If acid or electrolyte is added instead of water, when no acid is needed, the electrolyte will become too strong, and sulphated plates will be the result. If a battery under average driving conditions never becomes fully charged, it should be removed from the car and charged from an outside source as explained later. If, after the specific gravity of the electrolyte stops rising, it is not of the correct value, some of the electrolyte should be drawn off and stronger electrolyte added in its place. This should be done only in the repair shop or charging station. Care must be taken not to add too much water to a cell, Fig. 32. This will subsequently cause the electrolyte to overflow and run over the top of the battery, due to the expansion of the electrolyte as the charging current raises its temperature. The electrolyte which overflows is, of course, lost, taking with it acid which will later be replaced by water as evaporation takes place. The electrolyte will then be too weak. The electrolyte which overflows will rot the wooden battery case, and also tend to cause corrosion at the terminals. If it is necessary to add water very frequently, the battery is operating at too high a temperature, or else there is a cracked jar. The high temperature may be due to the battery being charged at too high a rate, or to the battery being placed near some hot part of the engine or exhaust pipe. The car manufacturer generally is careful not to place the battery too near any such hot part. The charging rate may be measured by connecting an ammeter in series with the battery and increasing the engine speed until the maximum current is obtained. For a six volt battery this should rarely exceed 14 amperes. If the charging, current does not reach a maximum value and then remain constant, or decrease, but continues to rise as the speed of the engine, is increased, the regulating device is out of order. An excessive charging rate will cause continuous gassing if it is much above normal, and the temperature of the electrolyte will be above 100° F. In this way an excessive charging current may be detected. In hot countries or states, the atmosphere may have such a high temperature that evaporation will be more rapid than in temperate climates, and this may necessitate more frequent addition of water. If one cell requires a more frequent addition of water than the others, it is probable that the jar of that cell is cracked. Such a cell will also show a low specific gravity, since electrolyte leaks out and is replaced by water. A battery which has a leaky jar will also have a case which is rotted at the bottom and sides. A battery with a leaky jar must, of course, be removed from the car for repairs. From time to time within the past two years, various solutions which are supposed to give a rundown battery a complete charge within five or ten minutes have been offered to the public. The men selling such "dope" sometimes give a demonstration which at first sight seems to prove their claims. This demonstration consists of holding the starting switch down (with the ignition off) until the battery can no longer turn over' the engine. They then pour the electrolyte out of the battery, fill it with their "dope," crank the engine by hand, run it for five minutes, and then get gravity readings of 1.280 or over. The battery will also crank the engine. Such a charge is merely a drug-store charge, and the "dope" is generally composed mainly of high gravity acid, which seemingly puts life into a battery, but in reality causes great damage, and shortens the life of a battery. The starting motor test means nothing. The same demonstration could be given with any battery. The high current drawn by the motor does not discharge the battery, but merely dilutes the electrolyte which is in the plates to such an extent that the voltage drops to a point at which the battery can no longer turn over the starting motor. 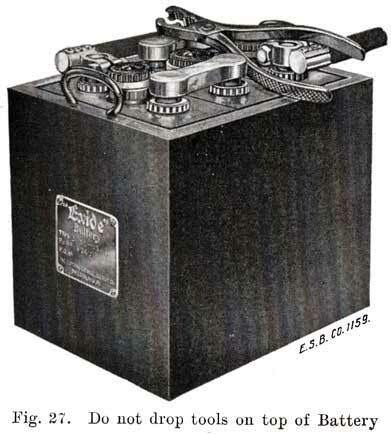 If any battery were given a five minutes' charge after such a test, the diluted electrolyte in the plates would be replaced by fresh acid from the electrolyte and the battery would then easily crank the engine again. The five minutes of running the engine does not put much charge- into the battery but gives time for the electrolyte to diffuse into the plates. No. 1. 1.260 specific gravity sulphuric acid, 25 parts iron, 13.5 parts chlorine, 12.5, per cent sodium sulphate, 1 per cent nitric acid. No. 2. 1.335 specific gravity sulphuric acid, large amounts of organic matter, part of which consisted of acids which attack lead. No. 3. 1.340 specific gravity sulphuric acid, 15.5 per cent sodium sulphate. No. 4. 1.290 specific gravity sulphuric acid, 1.5 per cent sodium sulphate. No. 5. 1.300 specific gravity sulphuric acid. If such "dope" electrolytes are added to a discharged battery, the subsequent charging of the battery will add more acid to the electrolyte, the specific gravity of which will then rise much higher than it should, and the plates and separators are soon ruined. Do not put faith in any "magic" solution which is supposed to work wonders. There is only one way to charge a battery, and that is to send a current through it, and there is only one electrolyte to use, and that is the standard mixture of distilled water and chemically pure sulphuric acid. 7. The specific gravity of the electrolyte should be measured every two weeks and a permanent record of the readings made for future reference. For determining the specific gravity, a hydrometer is used. This consists of a small sealed glass tube with an air bulb and a quantity of shot at one end, and a graduated scale on the upper end. This scale is marked from 1.100 to 1.300, with various intermediate markings as shown in Fig. 33. If this hydrometer is placed in a liquid, it will sink to a certain depth. In so doing, it will displace a certain volume of the electrolyte, and when it comes to rest, the volume displaced will just be equal to the weight of the hydrometer. It will therefore sink farther in a light liquid than in a heavy one, since it will require a greater volume of the light liquid to equal the weight of the hydrometer. The top mark on the hydrometer scale is therefore 1.100 and the bottom one 1.300. Some hydrometers are not marked with figures that indicate the specific gravity, but are marked with the words "Charged," "Half Charged," "Discharged," or "Full," "Half Full," "Empty," in place of the figures. The tube must be held in a vertical position, Fig. 35, and the stem of the hydrometer must be vertical. The reading will be the number on the stem at the surface of the electrolyte in the tube, Fig. 36. Thus if the hydrometer sinks in the electrolyte until the electrolyte comes up to the 1.150 mark on the stem, the specific gravity is 1.150. If the battery is located in such a position that it is impossible to hold the hydrometer straight up, the rubber tube may be Pinched shut with the fingers, after a sufficient quantity of electrolyte has been drawn from the cell and the hydrometer then removed and held in a vertical position. Specific gravity readings should never be taken soon after distilled water has been added to the battery. The water and electrolyte do not mix immediately, and such readings will give misleading results. The battery should be charged several hours before the readings are taken. It is a good plan to take a specific gravity reading before adding any water, since accurate results can also be obtained in this way. Having taken a reading, the bulb is squeezed so as to return the electrolyte to the cell. Care should be taken not to spill the electrolyte from the hydrometer syringe when testing the gravity. Such moisture on top of the cells tends to cause a short circuit between the terminals and to discharge the battery. In making tests with the hydrometer, the electrolyte should always be returned to the same cell from which it was drawn. The specific gravity of all cells of a battery should rise and fall together, as the cells are usually connected in series so that the same current passes through each cell both on charge and discharge. If one cell of a battery shows a specific gravity which is decidedly lower than that of the other cells in series with it, and if this difference gradually increases, the cell showing the lower gravity has internal trouble. This probably consists of a short circuit, and the battery should be opened for inspection. If the electrolyte in this cell falls faster than that of the other cells, a leaky jar is indicated. The various cells should have specific gravities within fifteen points of each other, such as 1.260 and 1.275. If the entire battery shows a specific gravity below 1.200, it is not receiving enough charge to replace the energy used in starting the engine and supplying current to the lights, or else there is trouble in the battery. Use starter and lights sparingly until the specific gravity comes up to 1.280-1.300. If the specific gravity is less than 1.150 remove the battery from the car and charge it on the charging bench, as explained later. The troubles which cause low gravity are given on pages 321 and 322. It is often difficult to determine what charging current should be delivered by the generator. Some generators operate at a constant voltage slightly higher than that of the fully charged battery, and the charging current will change, being higher for a discharged battery than for one that is almost or fully charged. Other generators deliver a constant current which is the same regardless of the battery's condition. In the constant voltage type of generator, the charging current automatically adjusts itself to the condition of the battery. In the constant current type, the generator current remains constant, and the voltage changes somewhat to keep the current constant. Individual cases often require that another current value be used. In this case, the output of the generator must be changed. With most generators, a current regulating device is used which may be adjusted so as to give a fairly wide range of current, the exact value chosen being the result of a study of driving conditions and of several trials. The charging current -should never be made so high that the temperature of the electrolyte in the battery remains above 90° F. A special thermometer is very useful in determining the temperature. See Fig. 37. The thermometer bulb is immersed in the electrolyte above the plates through the filler hole in the tops of the cells. Batteries used on some of the older cars are divided into two or more sections which are connected in parallel while the engine is running, and in such cases the cables leading to the different sections should all be of exactly the same length, and the contacts in the switch which connect these sections in parallel should all be clean and tight. If cables of unequal length are used, or if some of the switch contacts are loose and dirty, the sections will not receive equal charging currents, because the resistances of the charging circuits will not be equal. The section having the greatest resistance in its circuit will receive the least amount of charge, and will show lower specific gravity readings than for other sections. In a multiple section battery, there is therefore a tendency for the various sections to receive unequal charges, and for one or more sections to run down continually. An ammeter should be attached with the engine running and the battery charging, first to one section and then to each of the others in turn. The ammeter should be inserted and removed from the circuit while the engine remains running and all conditions must be exactly the same; otherwise the comparative results will not give reliable indications. It would be better still to use two ammeters at the same time, one on each section of the battery. In case the amperage of charge should differ by more than 10% between any two sections, the section receiving the low charge rate should be examined for proper height of electrolyte, for the condition of its terminals and its connections at the starting switch, as described. Should a section have suffered considerably from such lack of charge, its voltage will probably have been lowered. With all connections made tight and clean and with the liquid at the proper height in each cell, this section may automatically receive a higher charge until it is brought back to normal. This high charge results from the comparatively low voltage of the section affected. In case the car is equipped with such a battery, each section must carry its proper fraction of the load and with lamps turned on or other electrical devices in operation the flow from the several sections must be the same for each one. An examination should be made to see that no additional lamps, such as trouble lamps or body lamps, have been attached on one side of the battery, also that the horn and other accessories are so connected that they draw from all sections at once. Some starting systems have in the past not been designed carefully in this respect, one section of the battery having longer cables attached to it than the others. In such systems it is impossible for these sections to receive as much charging current as others, even though all connections and switches are in good condition. In other systems, all the cells of the battery are in series, and therefore must receive the same charging current, but have lighting wires attached to it at intermediate points, thus dividing the battery into sections for the lighting circuits. If the currents taken by these circuits are -not equal, the battery section supplying the heavier current will run down faster than others. Fortunately, multiple section batteries are not being used to any great extent at present, and troubles due to this cause are disappearing. The temperature of the electrolyte affects the specific gravity, since heat causes the electrolyte to expand. If we take any battery or cell and heat it, the electrolyte will expand and its specific gravity will decrease, although the actual amount of acid is the same. The change in specific gravity amounts to one point, approximately, for every three degrees Fahrenheit. If the electrolyte has a gravity of 1.250 at 70°F, and the temperature is raised to 73°F, the specific gravity of the battery will be 1.249. If the temperature is decreased to 67°F, the specific gravity will be 1.251. Since the change of temperature does not change the actual amount of acid in the electrolyte, the gravity readings as obtained with the hydrometer syringe should be corrected -one point for every three degrees change in temperature. Thus 70°F is considered the normal temperature, and one point is added to the electrolyte reading for every three degrees above 70°F. Similarly, one point is subtracted for every three degrees below 70°F. For convenience of the hydrometer user, a special thermometer has been developed by battery makers. This is shown in Fig. 37. It has a special scale mounted beside the regular scale. This scale shows the corrections which must be made when the temperature is not 70°F. Opposite the 70° point on the thermometer is a "0" point on the special scale. This indicates that no correction is to be made. Opposite the 67° point on the regular scale is a -1, indicating that 1 must be subtracted from the hydrometer reading to find what the specific gravity would be if the temperature were 70°F. Opposite the 73° point on the regular scale is a +1, indicating that 1 point must be added to reading on the hydrometer, in order to reduce the reading of specific gravity to a temperature of 70°F. 8. Storage batteries are strongly affected by changes in temperature. Both extremely high and very low temperatures are to be avoided. 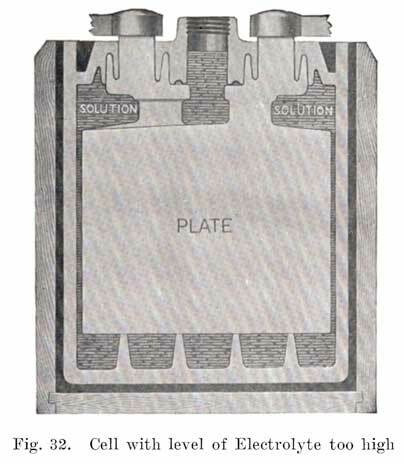 At low temperatures the electrolyte grows denser, the porosity of plates and separators decreases, circulation and diffusion of electrolyte are made difficult, chemical actions between plates and acid take place very slowly, and the whole battery becomes sluggish, and acts as if it were numbed with cold. The voltage and capacity of the battery are lowered. As the battery temperature increases, the density of the electrolyte decreases, the plates and separators become more porous, the internal resistance decreases, circulation and diffusion of electrolyte take place much more quickly, the chemical actions between plates and electrolyte proceed more rapidly, and the battery voltage and capacity increase. A battery therefore works better at high temperatures. Excessive temperatures, say over 110° F, are, however, more harmful than low temperatures. Evaporation of the water takes place very rapidly, the separators are attacked by the hot acid and are ruined, the active materials and plates expand to such an extent that the active materials break away from the grids and the grids warp and buckle. The active materials themselves are burned and made practically useless. The hot acid also attacks the grids and the sponge lead and forms dense layers of sulphate. Such temperatures are therefore extremely dangerous. A battery that persistently runs hot, requiring frequent addition of water, is either receiving too much charging current, or has internal trouble. The remedy for excessive charge is to decrease the output of the generator, or to burn the lamps during the day time. Motorists who make long touring trips in which considerable day driving is done, with little use of the starter, experience the most trouble from high temperature. The remedy is either to decrease the charging rate or burn the lamps, even in the day time. Internal short-circuits cause excessive temperature rise, both on charge and discharge. Such short circuits usually result from buckled plates which break through the separators, or from an excessive amount of sediment. This sediment consists of active material or lead sulphate which has dropped from the positive plate and fallen to the bottom of the battery jar. All battery jars are provided with ridges which keep the plates raised an inch or more from the bottom of the jar, and which form pockets into which the materials drop. See Fig. 10. If these pockets become filled, and the sediment reaches the bottom of the plates, internal short circuits result which cause the battery to run down and cause excessive temperatures. If the electrolyte is allowed to fall below the tops of the plates, the parts of the plates above the acid become dry, and when the battery is charged grow hot. The parts still covered by the acid also become hot because all the charging current is carried by these parts, and the plate surface is less than before. The water will also become hot and boil away. A battery which is thus "charged while dry" deteriorates rapidly, its life being very short. If a battery is placed in a hot place on the car, this heat in addition to that caused by charging will soften the plates and jars, and shorten their life considerably. In the winter, it is especially important not to allow the battery to become discharged, as there is danger of the electrolyte freezing. A fully charged battery will not freeze except at an extremely low temperature. The water expands as it freezes, loosening the active materials, and cracking the grids. As soon as a charging current thaws the battery, the active material is loosened, and drops to the bottom of the jars, with the result that the whole battery may disintegrate. Jars may also be cracked by the expansion of the -water when a battery freezes. 9. Care of Storage Battery When Not in Service. A storage battery may be out of service for a considerable period at certain times of the year, for example, when the automobile is put away during the winter months, and during this time it should not be allowed to stand without attention. When the battery is to be out of service for only three or four weeks, it should be kept well filled with distilled water and given as complete a charge as possible the last few days, the car is in service by using the lamps and starting motor very sparingly. The specific gravity of the electrolyte in each cell should be tested, and it should be somewhere between 1.280 and 1.300. All connections to the battery should be removed, as any slight discharge current will in time completely discharge it, and the possibilities of such an occurrence are to be avoided. If the battery is to be put out of service for several months, it should be given a complete charge by operating the generator on the car or by connecting it to an outside charging circuit. During the out-of-service period, water should be added to the cells every six or eight weeks and the battery given what is called a freshening charge; that is, the engine should be run until the cells have been gassing for perhaps one hour, and the battery may then be allowed to stand for another similar period without further attention. Water should be added and the battery fully charged before it is put back into service. It is desirable to have the temperature of the room where the battery is stored fairly constant and as near 70 degrees Fahrenheit as possible.